Uses Wrist Grab, the CD released about four years ago under the name Bone where he played with Hugh Hopper and John Roulat, was the last time I listened to Nick Didkovsky before the recently released Swim This - a live album introducing the trio of Didkovsky/Hemingway/Lytle - and the solo release Tube Mouth Bow String: both quite successful (at least from an artistic, if not from a commercial, point of view) and very stimulating albums definitely worth investigating. So I thought about asking Nick Didkovsky for another interview. I had already interviewed him twice. In 2000, our conversation had for the most part dealt with the story of Doctor Nerve, the group of which he has been the leader, guitar player, and composer for about 25 years. While in 2003, we had talked about the Bone trio, plus some of his work-in-progress in a variety of musical settings. (Of course, readers are invited to check our archives for those interviews.) Didkovsky is an extremely articulate writer, and I've always appreciated his ability to express quite complicated thoughts very clearly. The following interview was conducted by e-mail. Though Didkovsky was extremely busy, I received his answers on April 5, about two weeks after I had sent him my questions. Just one (minor) thing: In my fourth question, when talking about his Tube Mouth Bow String CD, I forgot to add the words "of the same name" after the word "piece". I'd like to start our conversation discussing your trio with Gerry Hemingway and Michael Lytle: Would you mind talking about the way it started, your musical relationship as a trio, etc.? Swim This began with Michael Lytle's initiative. Michael plays bass clarinet in Doctor Nerve but he has a long history as an improvisor (duo with George Cartwright, Meltable Snaps it, etc). Michael was offered an evening at Phill Niblock's Experimental Intermedia Foundation. He invited Gerry Hemingway (drumset and electronics) and myself. At first there was some talk of organizing our performance with some sort of loose score. But we ended up doing two sets with no score and no discussion ahead of time. That premiere performance was recorded; I mixed that multitrack recording and produced our first CD. We performed again last night as part of an evening of bands curated by Kevin Gallagher (Electric Kompany). It struck me again what a special combination of players this is. I feel like I can do anything at any time and the ensemble will respond fully and with complete attention and consequential responsibility. I believe the others express similar sentiments. The typical comment we are hearing from audience and press is that portions of it sound composed, that transitions in particular sound preplanned or cued, when in fact there's nothing like that going on at all. There is something really special in the Swim This chemistry; a level of telepathy that was unexpected before we first came together. I'd like to know more about the music featured on the Swim This CD: I would have really liked to attend that concert, because by only listening to the CD I can't really figure out what's happening, what parts the software and the pre-recorded tapes are playing, and so on. Please, talk about this. There's five elements going on in each set. Besides the clarinets, tabletop guitar, and drum set, I have musical software running, and Michael is playing some prerecorded electronics, mixing them in and out occasionally. I wish I knew what he was playing back, I think it's some of his analog synth work from the 60's. In the first set, my software uses up to four independent musical agents, whose behavior density I can specify, that is, how often each one wakes up and makes a noise, and how long that noise lasts before it quits and goes to sleep again. That density might be very high, upwards of 300 or 400 times a minute, or very sparse, maybe only once a minute or so. I set these parameters and let them go, turning them on and off occasionally and changing their behaviors densities now and then. The sound they are making uses a synthesis circuit called a waveshaper. A waveshaper is a simple circuit where one signal drives a function lookup table. So for example if the driver is a linear ramp that starts at -1 and rises to 1 over 10 seconds, and the table were filled with an audio sample of my voice counting from 1 to 10, then you would hear that recording played forwards, stretched or compressed to fit ten seconds. If you invert that ramp and have it fall from 1 to -1, you will hear me count backwards. If instead of a linear ramp you drive the table with a sine wave, you will simulate a turntable scratch: playing forwards as the sine wave rises, slowing down as it reaches the summit, playing backwards as the sine wave falls, slowing down again as it reaches the valley, changes direction again and plays forward. I fill ten "buckets" of audio with live electric guitar, and then use these as both the driver signal and the wavetables contents up to four waveshapers. Each agent chooses these waves independently. So the nature of their sound will be different from each other. This is responsible for the warbling and sometimes spiky sounds you hear intruding here and there. In the second set I use software I originally composed for The Monkey Farm for Doctor Nerve and Valeria Vasilevski, who recited stories written by Charles O'Meara (http://www.doctornerve.org/monkeyfarm/). The software was designed to color the human voice, and I have a collection of plug-ins written by Phil Burk, Robert Marsanyi, and myself that do that. After the premiere of that performance I adapted that software to process my live guitar. So there are some very vocal timbres there, particularly Robert's "Magyar Instrument" which encodes a male Hungarian accent in software. His circuit tries to distinguish between vowels and consonants in the input signal and treat them differently to impart this accent. It's interesting to send guitar signal into it and hear how it interprets that. So there's a lot of colors and musical behaviors that are generated by the three Swim This musicians of course, but there's these extra timbres and unpredictable electronic behaviors that add breadth and richness that you hear in the recording, and possibly some ambiguity and confusion as well! If I understood correctly, the Bone trio is not a "virtual trio" anymore, having played (at least) a concert in... January? Yes! 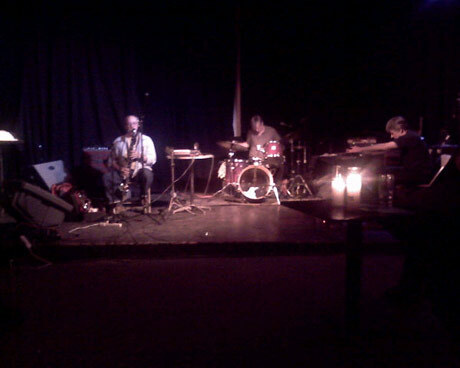 We premiered Bone as a live band courtesy of the great Bruce Gallanter who curated a month of music at The Stone in NYC. He invited Hugh Hopper to fly in from Kent and that opened the possibility to perform live with Bone. You know we really had no idea what to expect since we never expected to play live. I love both John's and Hugh's playing of course, but there's no a priori reason why we should perform well together as a live trio. Furthermore, none of the pieces were composed or arranged with the expectation that they could be performed live! But it was a truly ferocious and ecstatic performance. Ten minutes into our first rehearsal everything changed: we started with one of Hugh's tunes, Green Dansette. When it was done there was this sort of respectfully stunned silence in the room. A voice in my head went "whoah, this is going to be good." Can't wait to tour with this band. I'd like to talk about your solo CD Tube Mouth Bow String. I'd like to start from the piece recorded by the Sirius String Quartet. I imagine you are happy with the way it turned out? Sirius actually performs on all pieces except track 2, the solo guitar movement. Yes this was a very carefully constructed CD and I am very happy with how it turned out. When we perform the title track live, the players have to manage the bowed parts, the fully notated pedal movements, and the scored vowelizations, which are rhythmically very challenging. For the recording however, we factored these tasks apart, first putting down the bowed string part of every instrument individually. Then we recorded the pedal parts, which the performers ended up using their hands to control very precisely. Finally we recorded the talkbox performance which pipes all that through a vocal filter. So there's lots of control and precision there, which reveals the details of the composition beautifully. You really hear the contrary motion in the pedal glisses for example, and the rhythmic unisons between vowel parts. All that detail is in there so you can listen with different strategies, focus your attention on different sonic and formal aspects of the piece. Or take it in as a whole and immerse yourself in this landscape that is just dripping with rich sonics, something like tuvan throat singing orchestrated for strings. It really has these strongly opposing elements of both familiarity and extreme other-worldliness. Two other tracks with Sirius are process pieces that have real-time decisions made by the ensemble. One might think that would make the production process easy, that it would sort of drive itself. But in fact the number of choices I had due to having more than one take of each musician making improvised decisions made the production process extremely dense and decision-rich. Choosing certain tracks in post-production had enormous consequences for the piece as a whole. For example, I am very pleased with the mix of Barbara Benary's Chung Hu in What Sheep Herd. I changed strategies on the use of her improvised performance so many times, deciding how it should function in the mix. Finally I found the answer by bringing the level down so far that you have to strain to hear it. Sometimes it just barely melts into another string tone, other times it is revealed in a hole in the fabric. It sounds like a distant howl and sometimes you are not quite sure if it's there or not. And of course that brings more attention to it in a way, like the old aphorism (or maybe it’s a cliché by now), "if you want someone's attention whisper." Was this piece ever performed live? The entire program was originally performed live in the same order as is presented on the CD. Producing that concert actually led to the idea of creating the CD in the first place. The evening worked so well with these pieces complementing each other so gracefully, that the record just precipitated naturally from the experience. Of course, She Closes Her Sister With Heavy Bones, the first piece on the CD, had already appeared on the Fred Frith Guitar Quartet album Ayaya Moses... Would you mind talking about this new version? Well I love playing it with four electric guitars, and that it how it was originally performed. But that's not specifically how the piece was originally conceived. It's a process piece based on a single melody and some simple rules. So the ensemble is unspecified, and could be comprised of any instruments. Ross Feller, for example, conducted his student ensemble at Moorehead State University on this piece, and the richness of hearing that variety of instrumentation was very rewarding. In this newly recorded version we have a very clean electric guitar accompanied by strings, pitches chosen and sustained by the members of the quartet, which creates chance chords and passes these sounds around. You get some very beautiful and unexpected combinations of pitch elements, transposed in various octaves. After the guitar drops out you are left with an apparition of the original melody, some of whose pitches are implied by the remaining strings. I liked the Machinecore piece very much, are there other similar pieces in the can - or available elsewhere? Thank-you! I have some solo tabletop guitar + computer pieces that are very nicely recorded from a concert I did at Berklee last summer when Steve MacLean invited me there. 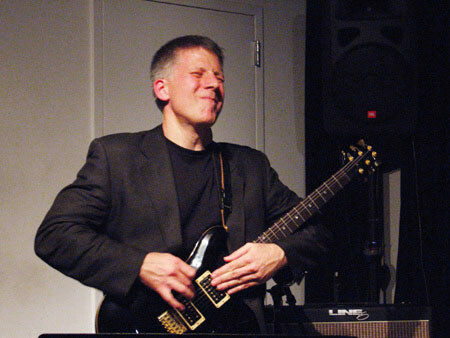 As a general rule, I tend to think of solo improvisation as something that happens live before an audience and that is really where it belongs, as opposed to recording and releasing some of it (that is, why not release all of it; selection for CD release is a compositional choice and it becomes ambiguous to call it improvisation any more). But I realize this is not the most enlightened position since it is an area in my creative world that is very important to me and obviously under-represented in recorded form. So maybe I should select some solo pieces and do another record some time. I don't know whether my perception is correct, but I think that once upon a time a lot of very interesting experiments happened in the "rock" arena, whereas nowadays many (former?) rock musicians are finding shelter in the (former?) academia/fine arts milieu... And I wonder whether it's a problem of funds, or whatever. I really don't know. Like who? What I mean is: A long time ago, people like... Frank Zappa, Henry Cow, King Crimson etc., were in a place where an audience bought their albums and attended their concerts, and the press covered their activities. No riches here, of course, but a decent life could be seen as a goal. Nowadays I see a lot of people working inside academia (Fred Frith, Elliott Sharp...) and/or playing in Festivals/Programs that are heavily funded, where the tickets don't cover but a fraction of the costs - just like in ballet, theatre, opera, etc. I wonder whether it's a problem of having the funds to stage something, or the fact that nowadays the audience have no interest in anything "difficult", when compared to the time when the aforementioned Frank Zappa, Henry Cow, King Crimson etc. were active. Thanks the question is clear now. I know from experience it's been harder for me to tour. Venues don't seem to be getting the same support from local and national sources that they used to (I am describing a span of something like the last 10 or 20 years). I don't think the distribution of human curiosity has changed, though. I'd wager that every generation of listeners has probably about the same percentage of people who want to experience something on the more extreme ends of creativity. It used to be that one achieved excellence, and so "success" (in a variety of meanings), by working really hard. It's been said that nowadays the "Lottery" ethic has replaced the "Hard Work" ethic as the route most likely to produce results, hence a "why bother?" attitude. I know it's a complex issue, and I don't know whether what I'm saying makes sense to you, but how do you see the topic of quality and innovation, in the arts and elsewhere? I don't think people have changed much in this respect. I remember a fellow student at the Creative Music Studio in 1980 yearning for that "one hit. All you need is one hit." He never got one as far as I know and I think sacrificed the opportunity to do a lot of creative and satisfying music in the process. I also saw very intense young bands at the time working so hard to get a record deal, and when it became clear they weren't going to get one, the drive was lost and they broke up. Meanwhile I was putting together Doctor Nerve, released my first LP on my own, never had a hit, and I have kept my band together for over 25 years. So I think there's always been this hunger for a magic bullet associated with the arts, certainly with music. That if you just got a hit or a record deal or the right manager or whatever you'd make it. And these discussions of success never had anything to do with artistic vision or excellence, they always had to do with the manipulation of art and the control of public opinion. So I think if instead you define artistic success as engineering a life where you stay continuously creative and genuinely excited about what you do, then you really have taken responsibility for your work, and taken control of it for yourself. We don't know whether in five years record companies as we know them will still be around, nor whether the physical CD will still be in existence. Of course, there are many points we could discuss here (and of course you're welcome to do this! ), but: Do you think that the (vastness of the) Net will make things any easier for people who are way outside the mainstream? Yes there is no doubt that the internet makes possible music distribution that was not available beforehand. To take my solo CD Binky Boy as a concrete example, before the internet I'd have produced 1000 copies and relied on mailings, touring, and a handful of distributors to get the music out. With the web, there was a slight improvement, as I was able to put up a page with info about it, a few sound clips, and ordering info. So that's already a little better, as people might serendipitously come across that page. But the current situation of having it available on iTunes Music Store, EMusic, and other digital distribution sites is the most promising. Nobody has more shelf space than anybody else on iTunes (disregarding the paid ads and banners for selected artists that you see when you first log in, and I know that's a lot to overlook). But still, I think, digital distribution is a very positive development. And of course people who still want a full resolution audio CD can still order the CD itself, get the art, liner notes, etc. More interesting implications for musical distribution over the internet, in my view, is real-time music. By this I do not mean streaming audio but real-time audio created automatically or interactively. For example, I designed software version of the Cowell/Theremin Rhythmicon, an early 20th century electronic music instrument. It is available at http://musicmavericks.publicradio.org/rhythmicon/ You can play it, record a piece, upload it, download others' works, etc. It is like an online Player piano in this respect and really does not fit many of the current models of music distribution, but it has a strong identity and has catalyzed hundreds of compositions and a CD of pieces composed with it as well (Innova Records). Another example is Music for HotSpots, which is another re-tooling of the Monkey Farm software I discussed earlier (the one with the Hungarian accent). Dubbed Music for Hotspots, it is available at http://www.punosmusic.com/pages/musicforhotspots/ The idea is that you can put on headphones, turn on your laptop's internal microphone and listen to your environment severely altered through these sound modifiers. It is a very disorienting experience to be, say, in a coffee shop, watch people's mouths move in conversation and instead of hearing their speech you hear barely comprehensible sound. You just need an internet connection, headphones, and a laptop... I have it on right now, without headphones, and the sound of typing is creating these echoing rhythmic patterns which are sort of amusing to have going on the background. But for all this, I think there will always be a place for a physical object like a CD or something other tangible object that you can hold in your hand, examine, read, mull over... just remember your favorite records when you were a kid, how much time you spent staring at the record cover, memorizing the details while the record was playing. There's nothing that will ever replace that experiential, sensory interface with a tangible object. That is not to say tangible media won't disappear! Extinction does not care how much you value that which was lost, extinction simply "is". So I am not predicting anything here. I just know I miss the beauty of the 12" album cover, especially the ones that opened up (but I don't particularly mourn the loss of the petroleum product inside). 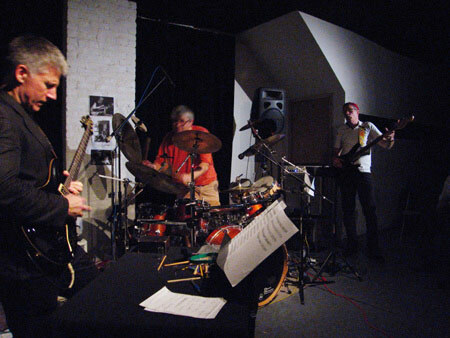 I know you've played with an improvising guitar quartet featuring Keith Rowe, Hans Tammen, and Erhard Hirt. And that you recorded some duo improvisations with Henry Kaiser. Is there any chance to hear those, live and on CD? Henry and I recorded in his studio when I was in the Bay area a couple of years ago. That was a fun afternoon; he hosts a good guitar party. We mixed a couple of these pieces and a year later sent them to Kalvos and Damien's New Music Bazaar which gave it some airplay. I wonder if that's available online anywhere in their archives...? We do have a number of recordings of the quartet with Rowe, Tammen, and Hirt. We've toyed with the idea of releasing them but things have not lined up yet in that regard. We are playing together again in September in Budapest at a computer music conference, playing a software guided improvisation which I will compose. Maybe something will come out of that. Is there anything else you would like to talk about? Have your say! Today I am going to Washington Heights to hear Either/Or Ensemble rehearse my new piece If Reptile's Organs Thrive for piano and violin, which will premiere on Friday. I am working on a new piece for the combined forces of the string quartet Ethel and Kevin Gallagher's Electric Kompany. Also getting ready to release a music notation object for the popular Max/MSP computer music platform. I want to release The Monkey Farm on CD some time soon-ish, and I have Ice Cream Time (for ARTE Sax Quartet, Thomas Dimuzio, and myself) coming out on New World Records this summer. My older son Leo is playing drums, and my younger son Sasha is playing guitar. Life is good.